Hello, and welcome to 2015!!! We are so excited and have so much to share with you. First off, click through to our “about us” above, in the website header. It’s new and updated, although it might be better said that it’s more in-depth, since we aren’t really new (we’re in our 30’s after all), and we haven’t really been updated (unless you include Farmer Joscelyn’s various surgeries). You’ll find our story there, as well as our management and farming practices spelled out. We are scrubbing up some other little rough spots, so there might be more to see over the next few weeks. We are super excited about the outcome from our farm meeting a few weeks ago. In short, we are planning on more animals on the farm this year and a test Vegetable CSA. We are raising pigs again, as well as turkeys for Thanksgiving and 2 batches of chickens. All are pasture-raised, organically-fed and humanely-processed here on our farm just as before. For the chickens, we will have two different pick-up dates to try to accommodate more people. Turkey and pigs will be done near the end of October, with a last batch of pigs done in December. All of the details for each of these items can be found through the links below. If you want to get in line for some of the tasty meat, simply click on the links that interest you and follow the instructions. If your mind is currently blown, just reply to this e-mail and we can send you copies of the info. sheets for anything you are interested in. Now, how ’bout that Vegetable CSA? Well, after hours of garden planning and talking through work load and expectations, we are sticking to our guns and running the Veg CSA as a test this year. What does that mean? It means that we are running a very small (10 share) CSA for a pilot group of customers that will be patient as we work out the kinks and give us the needed feedback for improvement. If all goes well, we will be going all-in on this in 2016. In fact, it’s shaping up to be the cornerstone that our farm is going to run on. Although we both prefer raising animals to plants, a living just can’t be made on 5 acres with only animals. With a small 100 member CSA, it’s within reach, and we can still run our goats, pigs and various poultry, all without compromising our care and stewardship goals for the property. Did I mention that we are excited? It’s all out of our hands, but God-willing, we will be calling ourselves full-time farmers in just a few short years! How can you help with this awesome dream?!?! Well, if you’re not already a customer, please consider allowing us to grow food for your family. Additionally, if you have friends who care about environmental stewardship, where food comes from and local economy, please consider sharing this message with them. We can assure you this e-mail will forward flawlessly. Again, we love to hear from our customers and would be happy to send you more info. on any of our available offerings for 2015! Spring is coming, the grass is starting to grow, and the birds are getting louder every morning. This entry was posted in Critters, Food and tagged friendly farms, Organic, Organic Pigs, Pastured Poultry, Stanwood, Sustainable farming, Thanksgiving Turkeys on February 4, 2015 by adalynfarm. When the animals leave home…. How to Make Canadian Bacon at Home. 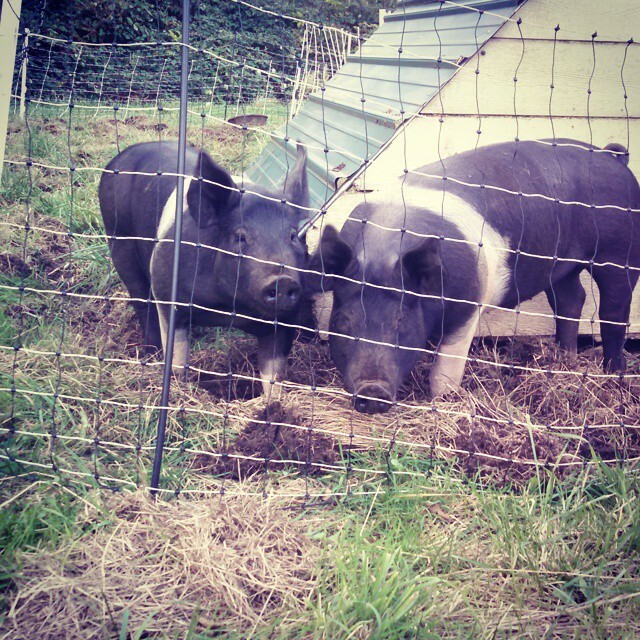 This entry was posted in Farmer Adam, Food and tagged friendly farms, Organic Pigs, Small Farming, Stanwood on January 11, 2015 by adalynfarm. Alternate titles include “The pigs are getting fat”, “Dark days are coming” and “What I wanted to post”. Ah the best laid plans. Although a plan is better than a wish, or something like that. I had planned to post about our pigs on the same day we had our Llama go down. Caring for livestock isn’t like having a pet cat or dog. You can’t always just load them up in the car and whisk them into the emergency vet. Sometimes problems happen at 5am, and the only person on call with a response time that will work in the given situation is you. So things go delayed. I’m sure you understand, at least, given the response on social media, folks understand. So what about the plan? Well, like my current favorite quote “a dream with no plan is just a wish” we have a plan for 2015, and beyond. It’s ambitious, and exciting, and I am sure it will be fun. It includes a little more in the way of updates, and food, and fun. But I don’t want to let the cat out of the bag too soon (and not because I’m not a fan of cats, but because we need it to be dialed in before we start shouting things from the mountaintop). Now to the pigs, cute aren’t they? They have been moved three times now, on our property. Unless you’ve had pigs, on your property, without perimeter fencing, you may not appreciate the gravity of that last statement. They weigh around #200 now, and don’t come when they are called. In fact, they kind of do whatever they want. And when you want them to go from one electric fence enclosure to another, it isn’t exactly like you can open a gate and lead them in. Let’s just say it sometimes involves lots of running, and the expenditure of vast quantities of treats. And pigs are fast. Think of them like a small hippo. But it has gone well (so far). A little panic when someone was leading them at a high rate of speed into the new paddock, and after dropping the feed pan, the pigs thought it would be more fun to keep chasing the person (in case they kept dropping treats). The fence was cleared, and I’d give the jump a clean 10/10, however the landing was a bit rough, probably only a 7.5/10. However, since everyone ended up where they were supposed to, it’s a win. We are sold out for the year, turkeys for thanksgiving, and meat chickens. The pigs are pre-sold as well. Never fear, our plans are for more of all of the above next year, and if you and anyone you know would like to get a shot at any of the goods, have them sign up for our newsletter. Sign up is on facebook (www.facebook.com/AdalynFarm) and on our main page on our web site. If you wonder over to the facebook page, please give it a like, if you haven’t, and if you’ve enjoyed any of our farm offerings, we’d be super grateful if you gave us a review. I think that’s all for now. But there is more to come! ps- thank you to all the folks who had us grow food for them this last year! It was a profound honor to be your farmers! 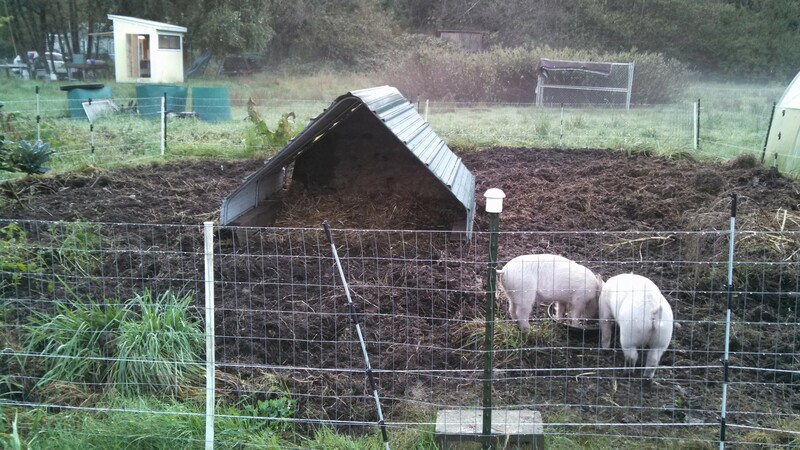 This entry was posted in Farmer Adam, Food and tagged friendly farms, Organic, Organic Pigs, Stanwood on November 8, 2014 by adalynfarm. 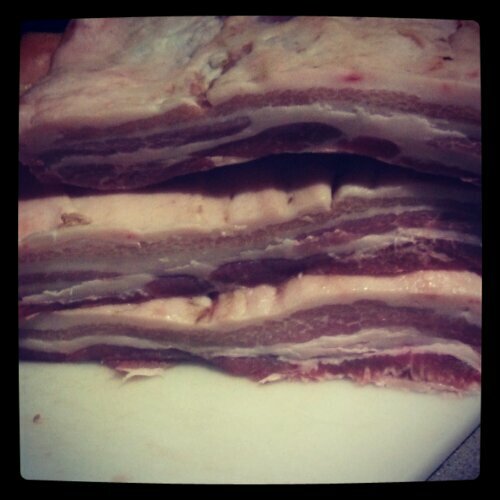 We have had some of the pork, but are really excited to be finally getting the bacon cured. Salt, and sugar on some, salt sugar and honey on another. Next up will be more sausage making! 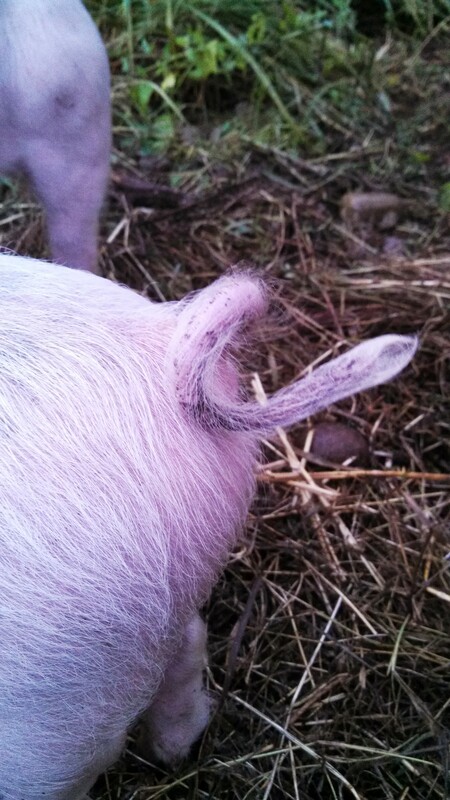 This entry was posted in Critters, Farmer Adam and tagged Organic Pigs, Small Farming, Stanwood, Sustainable farming on March 15, 2014 by adalynfarm. With all the rain we got over the past few days, we needed to get the pigs into some fresh dirt. The plan was/is to let them turn over the garden that was fallow this year (done) and then let them into the garden after we pulled out the last of the stuff we wanted to save, and let them turn that over as well. That’s what they are up to now. In fact, last night when I went out on my before bed farm check at about 11:20, they were still up, digging away in the new dirt. They did look a lot like a coupe of 7 year olds, caught reading under the covers after lights out. It was in the lower 30’s too. Silly piggies. Here’s a little video, that could probably have just been a picture. 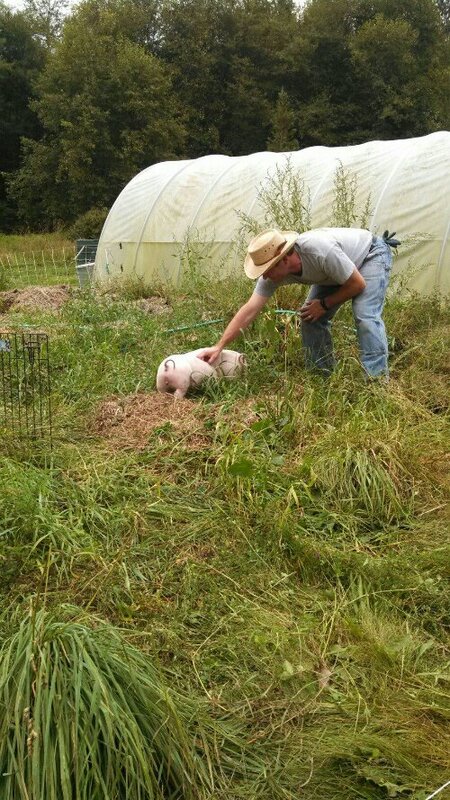 This entry was posted in Critters, Farmer Adam and tagged Organic, Organic Pigs, Pigs, Stanwood, Sustainable farming on November 7, 2013 by adalynfarm. I could not love these guys more. And as much as I’m going to miss them when they are gone, I’m going to love them still (as bacon, sausage etc). We started with two pigs as a trial a few months ago. Tracking time, expenses, that kind of thing. Although pigs are/were new to us, we had wanted them for several years. We often have a surplus of milk, and produce from the garden. In the fall, it seems like the compost pile and chickens eat as well as we do, and while that’s all well and good, giving pounds and pounds of apple and pear pealing to the compost pile seems almost like a waste. Especially when I know you can make them into tasty pork products. So this fall, with gallons of goat milk in the fridge, and the cheese shelf mostly full, we got two little weaner pigs. Harry and Tubbs, came to live with us, and while it took us a little time to gain their trust, they now come barking when they see the green feed bucket. Just a little more rooting and they will have the other half of the garden to play in! As far as change goes, it’s only on the outside. You’ll see some little things getting tidied up (new logo, and I’m going to refine the web site). We are excited about this having worked with a great graphic artist out of Sacramento CA for our logo. Stationary, and real business cards are in the works too! 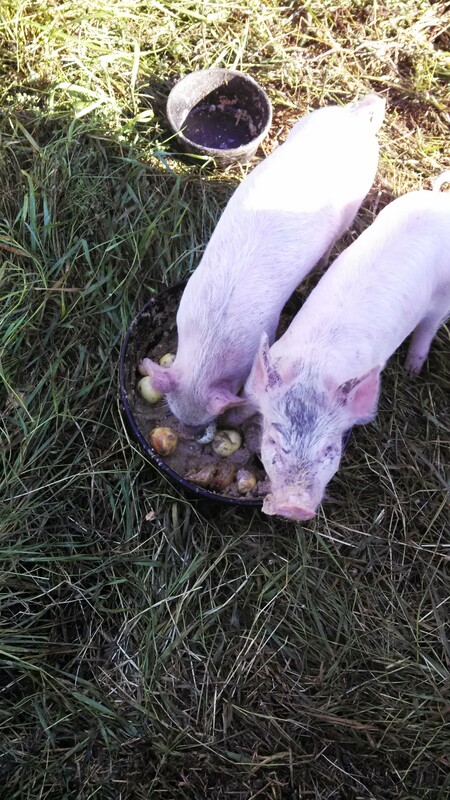 This entry was posted in Critters, Farmer Adam and tagged farm photographer, Organic, Organic Pigs, Pastured Pork, Small Farming, Stanwood, Sustainable farming on October 8, 2013 by adalynfarm.